Leicester Tigers will be helping to commemorate the 100th anniversary of the end of WW1 when the club welcome Sale Sharks to Welford Road in the Premiership Rugby Cup on Friday, November 9 (7.45pm). The club will be hosting members of the Royal British Legion and Royal Leicestershire Regiment as well as paying tribute to the 46 former Leicester Tigers players who paid the ultimate sacrifice during both World Wars. Ahead of kick-off, there will be the traditional playing of 'The Last Post' and minutes silence as well as a special wreath laying ceremony. 46 wreaths named after each of the 46 fallen Tigers will be held supporters and will be laid by the 'Wall of Legends' by the Robin Hood Stand reception point post-match. The club is giving fans the opportunity to represent one of the 46 and be a part of the historic anniversary remembrance as well as help to raise money for the Leicester Tigers Foundation. For a donation of £100, fans will be a part of the evening's remembrance with the honour of holding one of our 46 wreaths and laying it amongst the 'Wall of Legends. 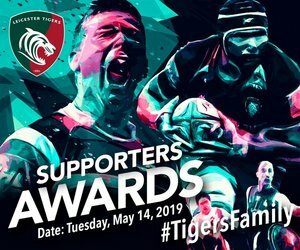 You will also receive two complimentary tickets to the match, as well as have your name engraved on the proposed Tigers Foundation Monument as a contributor.